The Tiger Who Came To Tea was one of my top favourite books as a child and now my son is as fond of it as I was, but it’s a strange experience to re-read, as an adult, something you knew inside out and back to front as a child. Everything that seemed so obvious, straightforward and normal when I was three strikes worrying notes as a grown-up and I began to question the true story behind the story. For a start the tale seems to be told less from the point of view of Sophie, the little girl (as you’d expect from a children’s book) and more from the POV of the mother. Straight away this makes me question the motives behind the story – is it a true depiction of events, or is she embroidering the situation to draw her daughter into her fantasy life and aid her in the deception of her husband, the ‘Daddy’ of the story? My instinctive understanding of the book from this new perspective is that ‘Mummy’ has some kind of mental health or addiction issue, possibly drugs or alcohol. Firstly she seems to need to run through a list of the possible menfolk who may or may not be at the door unexpectedly – does she have debtors calling? Is she selling favours? Does she owe the milkman and the grocer money? This is a possibility that seems to be borne out by the ‘Tiger’ supposedly drinking all the water in the taps – perhaps the bills have gone unpaid and the water’s been switched off. The Tiger is obviously the excuse ‘Mummy’ has cooked up to excuse her shoddy housekeeping and other misdemeanours to ‘Daddy’ and when you read that this Tiger has apparently drunk all of Daddy’s beer, the reason for her behaviour comes clear. She has a burgeoning alcohol addiction, as so many middle-class, middle-aged women do. Why? I hear you ask – well the answer to that is apparent if you only look at the illustrations. 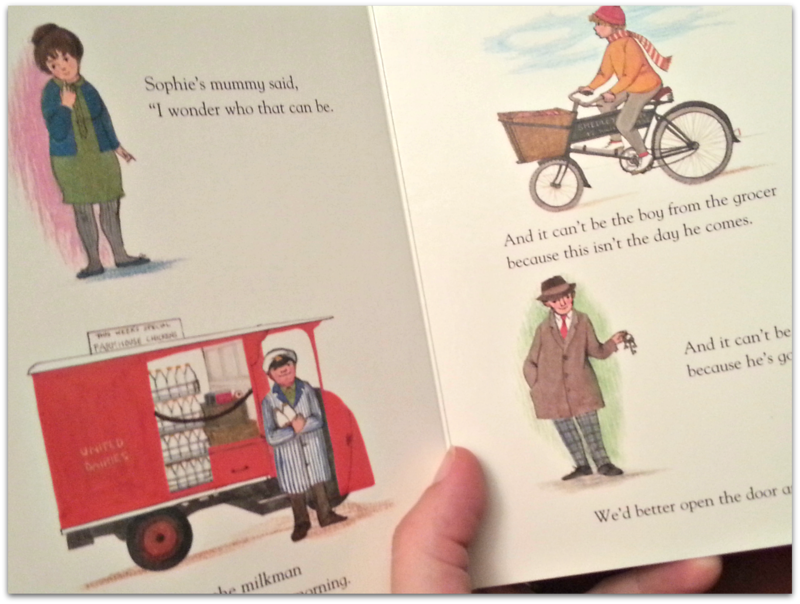 The first portrayal of Daddy shows him wearing some very snazzy tartan trousers and standing with his hip jutting out and his keys held limply in one dangling hand. Yes. Daddy is a closeted gay. Mummy finds herself trapped in a dreary domestic drudgery to a man who does not find her attractive and to whom she is merely a beard. She has one precious child, but not the three she always dreamed of and in her loneliness turns to alcohol to see her through the day. She drinks one of her husband’s beers, then another, then another until they’re all gone. Sneaking out of the back door she also smokes a quick spliff she bought off the grocer’s boy, then comes back in to find Sophie has laid the table for tea. The munchies start to hit and she’s ravenous but how to explain her behaviour to Sophie? There’s only one thing for it. She quickly spins a story inspired by the repeatedly ringing doorbell. 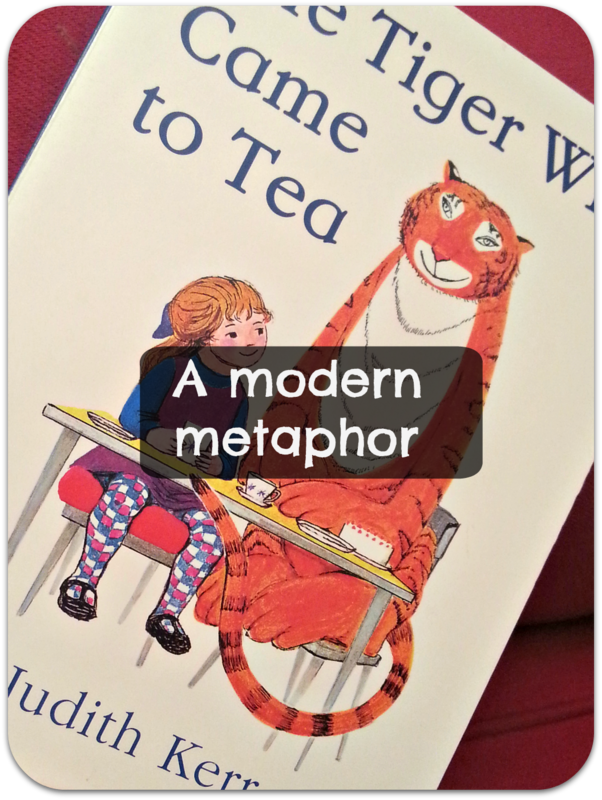 Ignoring the milkman and grocer’s boy – both trying to claim the money they’re owed – Mummy pretends there’s a Tiger at the door and he wants to have tea with them. Taking the part of the Tiger, Mummy devours the sandwiches, the buns, the biscuits and the cake. Her throat raw from the spliff, she gulps down all the milk in the milk jug and all the tea in the teapot. Mummy seizes this opportunity to make excuses for the lack of any supper for Daddy and the paucity of food in the ‘fridge and pantry, caused by her neglect of the grocer’s bills. The kitchen is a complete mess and Daddy is due home any minute, so Mummy hurries Sophie into her nightdress without washing her or brushing her hair and they both go down to tell Daddy all about the ‘Tiger’ who had eaten all the food and drunk all the drink. Daddy sighs inwardly, but knows the true reason for Mummy’s neglect and disreputable behaviour and knows that it is him to blame really. He takes them out to dinner and, perhaps, he gently talks to Mummy about her ishoos, because this book thankfully has a happy ending – a tale of redemption and optimism if you will, because the next day Mummy pulls her act together and went shopping and on the final page it states that the Tiger, obviously a metaphor for Mummy’s descent into alcoholism, never came for tea again. Or perhaps Judith Kerr just wanted an excuse to paint a big, friendly tiger eating cakes. Go figure. Just in case it isn’t absolutely, screamingly obvious – this post is intended as totally tongue-in-cheek, inspired by the lovely surrealism of one of my favourite childhood books. If you enjoyed this style of post, then why not try ‘Another Day For Me‘ – a critical analysis of Nick Cope’s song of the same name. I found your blog as I googled whether or not anyone else perceived mother to be an alcoholic. I fully agree with your points as a valid modern interpretation of this book, tongue in cheek or not. Hi, I'm Milla. Unapologetically middle-class, rising middle-aged, hippy-dippy mum of two and erstwhile blogger, writer, PR consultant. I live in Oxfordshire and here I write about our family life, reviews of products and places, my tops tips (garnered from hard-won experience) and (not as often as I should considering the blog's name) life in this lovely county. For a bit more info about the players on the stage of my life have a look at my 'About' page.